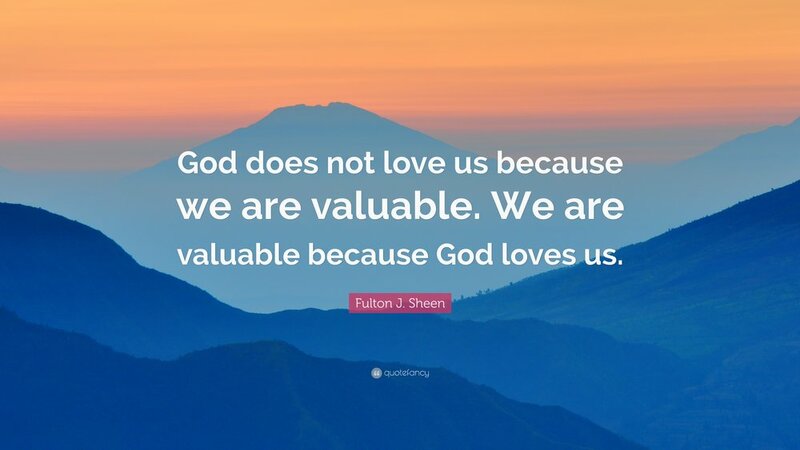 Jesus leaves us with no doubt: We are valuable. We all carry within us a God-given dignity. And this dignity is identified and enhanced when we bear his name. Every human being has an intrinsic dignity because every human being is created in God’s image. To carry his image is also a responsibility. We must live up to this dignity and show to others a life worthy of the image we carry within. Others may be “little” due to their age, the newness and immaturity of their Christian life, or even their weakness and struggle. If we put a stumbling block in their way, we scandalize them or causes them to doubt or become discouraged about living the ideals of faith. A “millstone” suggests that anything would be better for us than this. It often seems challenging or almost impossible to live out the Sermon on the Mount. Implementing it even in small ways often involves creative thinking outside of the usual patterns of thought as well as discernment about what is happening in our world. In today’s world, the value of something is measured in comparison to other items of the same kind: stocks, food, clothes, even music and films are judged against each other. Yet, there are some things that have absolute value: the value of a soul. Nothing compares! Jesus paints this total non-comparison in terms of cutting off whatever becomes an obstacle. You are so valuable that you must be ready to deny, subdue, silence and even sacrifice your own body, or any of its members, rather than risk losing your soul. Do we value our immortal soul, our vocation to eternal life? If so, do we show this by the self-denial we exert in controlling what makes us, and eventually others through me, stumble? How often do we prefer our “things” to the loved ones who depend on our example of Christ? How radical is our faith? Jesus is very demanding with those of us who are his followers. But Jesus simply wants to emphasize that we must learn how to give up those things that may hurt us, even though we like them, for they can be the cause of all sin and vice. St. Gregory wrote “we should not covet those things that only meet our material and sinful needs”. Jesus expects us to be radical. In another part of the Gospel, it is written: “Whoever finds his life will lose it, and whoever loses his life for my sake will find it”. On the other hand, Jesus' demand is a demand for love and maturity. What will make our deeds meaningful must always be our love: we should know how to offer a drink of water to whomever needs it, but not because of any personal interest but, simply, out of love. We must discover Jesus in those more needy and poor. Jesus only severely denounces and condemns those who do evil and shock us, those who make the little ones relinquish the infinite goodness and grace of God. The letter from James touches on what Pope Francis has said. Pope Francis talks about an “ambivalence” created by the world of finance and commerce. Never have these two worlds allowed so many people to benefit from so many goods, while at the same time “excessively exploiting common resources, increasing inequality and deteriorating the planet.” He says that during the trips he has taken since becoming Pope he has seen first-hand this “paradox of a globalized economy which could feed, cure, and house all of the inhabitants who populate our common home, but which– as a few worrisome statistics indicate – instead concentrates the same wealth owned by half of the world’s population in the hands of very few people”. Business leaders must be especially diligent about paying their workers fairly. James’s words “the wages you have kept back by fraud” are an accusation of abuse of power on the part of these wealthy landowners. The workers were owed wages, but the rich and powerful found a way out of paying them without incurring punishment by the legal system. The rich and powerful often have means to subvert the judiciary, and it’s astonishingly easy to exercise unfair power without even recognizing it. Misuse of power can never be excused just because it is a so-called standard practice. Let us and the Church unite ourselves to the millions of men and women who say ‘no’ to injustice in peaceful ways, doing what is possible to create greater equity.